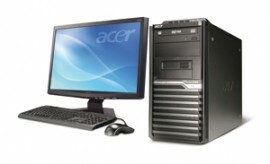 Acer Veriton M670G come with Intel® Core™2 Quad Processor Q9500 (6MB L2 cache, 2.83GHz, 1333MHz FSB) , windows 7, ntel® Q45 Express chipset with Intel® ICH10DO (I/O Controller Hub 10 Digital Office),it is a must-have for today’s business environment, provides enhanced security and manageability for office networks. Veriton® ControlCenter*OEM, not full-featured, version. Three-year limited warranty* with limited on-site service***For a free copy of the standard limited warranty end-users should see a reseller where Acer products are sold or write to Acer America Corporation, Warranty Department, P.O. Box 6137, Temple, TX 76503. **On-site service applies to the continental U.S. and Canada only and may not be available in all locations. In those areas where on-site service is provided, a technician will be dispatched, if necessary, following efforts to resolve the problem by telephone support.